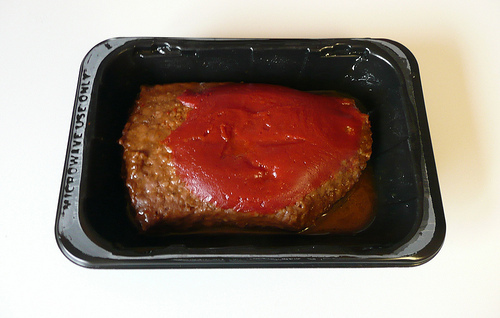 This post is filed under Hall of Fame (Looks), Hamburger, Hormel, Microwave, Refrigerated, Tomato Sauce. I spread the sauce over the whole loaf after taking the unsliced picture. I think if it’s not on sale, the loaf costs about seven dollars and would probably feed 2 people. 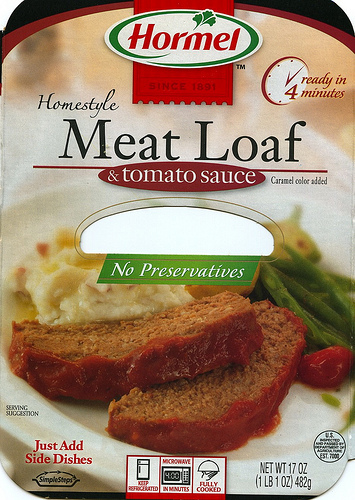 Hormel Meatloaf is awesome. Makes a great sandwich too. Wow, surprising. The sliced pictures has waves in the ketchup while the whole platter pic doesn’t, eerie. How much did this loaf cost you? How many people do you think it’ll actually feed? I love your meatloaf! I have cooked it several times of the past few years and it is great for dinner as well as making meatloaf sandwiches to take to work during the week! Where can I purchase Hormel Home Style Pre-cooked Meats in Cincinnati? Kroger has stopped selling your Simple Ideas. I am a senior citizen and just loved ALL of your Simple Ideas – Meat Loaf, Chicken, Beef Tips, Pork Roast, etc.. They are so simple to use and are DELICIOUS. Jo Ann Brems, 3670 Aston Woods Drive, Cleves, OH 45002. 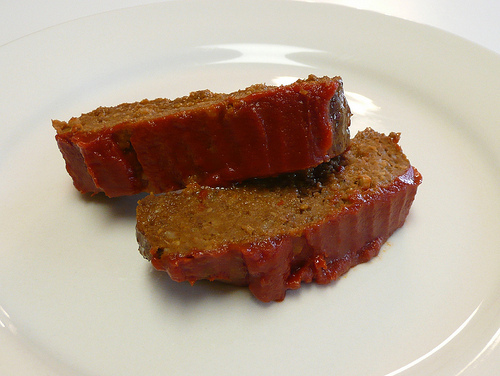 There is NO MEAT in the meat loaf — it is an orange colored “no meat” meatlessloaf with it’s protein from Whey not meat. I give it 0 of 5 out of 5.